One of the reasons many market observers believe this recession will be a long one is the growth in consumer debt over the years. As consumers now focus on paying down debt levels, they won't be able to spend to the same extent; thus, fewer goods will be produced, acting as a drag on GDP. But what is worth mentioning is that this argument is used in every recession by those who anticipate a depression, so are things really that different this time? In an article in Forbes magazine in 1991, Ken Fisher responded to those who argued that the recession of the early 1990s was to turn into a depression because mountains of consumer debt had to be paid back before the economy could once again grow. In Fisher's view, this argument was nothing more than fear mongering, as it ignored consumer income. 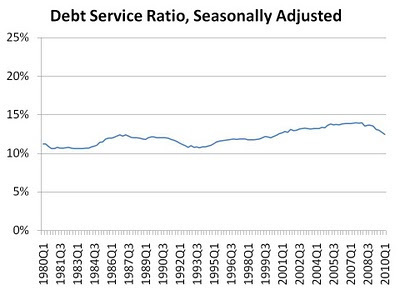 While absolute debt levels were high, debt as a percentage of income was not. The DSR is clearly not out of line with what it has been over the last 3 decades. Though it is still higher now than it was in the early 1980s and early 1990s, how is one to know what is the "right" level of consumer debt? Fisher argued that as long as there are assets that generate substantially more returns than the cost of debt, there will be people who exploit such opportunities, thus driving up the level of debt. Whether the DSR will turn upward soon, or continue downward for some time is anybody's guess. The point is, debt levels are not way out of line with what they have been in the past, and that the ideal consumer debt level for this economy may well be higher than debt levels stand right now. Reading articles from previous recessions can offer investors perspective. Often, the same situations are seen again and again, but are claimed to be "different this time". Educating oneself is the best defense against spurious arguments. However, timing when debt levels will start to once again expand is very difficult to do. As such, investors are better off keeping perspective with respect to the market, and putting their energy towards investing in companies trading at discounts to their intrinsic values. Interesting take, but it doesn't take into account record low interest rates. When the economy improves and capacity utilization increases, interest rates will have to rise to cool inflation. The interest payments will increase, raising the ratio, once again. very good article. I'd like to point out that while I don't know if it different this time or not, some really smart guys are saying that it is different this time. Klarman is saying we will probably have negative or very low stock market returns over the next decade. Munger is indicating that things are still looking gloomy. Buffett says that things are looking up. Who knows! You are right that rates being low is helping to lower this ratio. However, even when rates rise, there is a lag effect to the ratio as many loans are fixed rate (fixed at low rates). Furthermore, when rates rise, it is because disposable income is also rising, so the denominator rises along with the numerator. The net effect is a dampening of the increase in the DSR. In any case, all I'm trying to show is that debt payment requirements are not at some crazy level such that our economy is about to collapse. The private sector continues to deleverage, but the situation is not dire when viewed in a historical perspective. 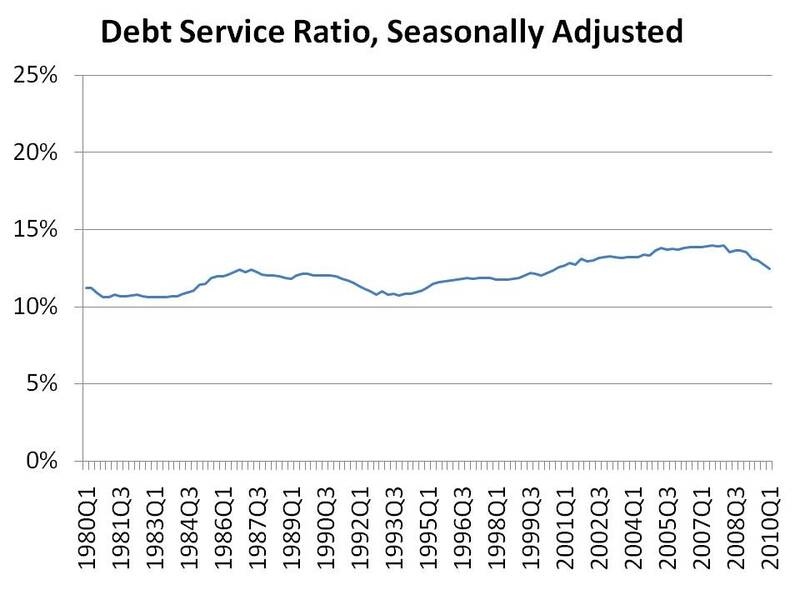 Please check the follow reports ..
Canadian Debt to Service ratio even with these low interest rates are not looking that great. What do you think about Conn's?